I love online polls. Why? Because once I’ve chosen my option, I then get to see the results – everyone else’s opinions. I find the results so much more exciting than choosing an option. The problem with surveys, on the other hand, is that you don’t get the see the end numbers. They’re hidden away where only the person who created the survey can see. Well, seeing as I get intensely curious when I participate in surveys, I thought some of you might too. Therefore, I’m sharing a few of the results with you all. So, here we go. I’ll just keep to the highlights. I found the results for this surprising. 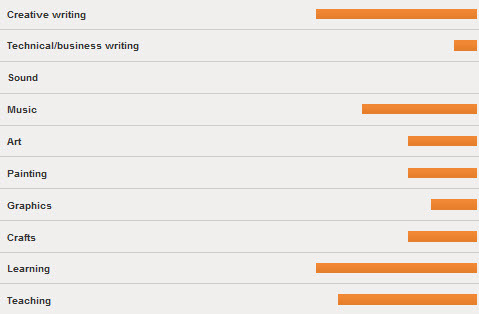 54% chose short stories, which I only put in there as a bit of a ‘throw away’ option. I’ll have to start cooking some more up, although I’m not sure what would be the best way to provide them. Any suggestions? 27% selected book reviews, which also surprised me. I’m ashamed to admit how many books I’ve read over the past year, but now I have an e-reader I’m looking forward to the ease of purchasing books online instead of heading to the foreign language book store every time I want to browse for a new title. I’ve just started reading a book on innovation which I’m finding very interesting. The problem is, one blog post wouldn’t do it justice. Therefore I’m thinking of encouraging you to read it with me, perhaps discussing one chapter per week. What do you think? Are you interested? 73% chose guest posts, and I have our first guest post already scheduled for later on this week! If you’re interested in submitting a guest post, please read the new guest post guidelines. 46% chose interviews. I haven’t yet made progress on preparing and lining up interviews, but I hope to change that in the new year. For the 36% who found the resources area appealing, you’ll be happy to know I’ve started on it. Pop over and have a look. It’s still in the very early stages. I have plenty more to add, as I find the time. 36% selected e-books and I have further news. I’m working on another e-book already. Stay tuned! 80% of participants would be interested in receiving an e-mail newsletter. I’ll get back to this soon with a poll on possible contents of a newsletter. As always, I’m interested in your opinions and what you would find most useful. Thank you to everyone who participated in the survey and left comments! I was extremely nervous when I started (my husband had to push the publish button because I had too many butterflies) but you have made it a really wonderful experience. I am now armed with lots of interesting and useful information which I will use over the next year to continue to write the content you enjoy reading. I appreciate each and every one of you. Thank you for being so kind and generous with your support. P.S. I’m also working on an avatar for Creativity, but you’ll have to be patient as I slowly put all my new features into action. Categories: News | Tags: Creativity, Creativity's Workshop, results, survey | Permalink. I admit that I was one of the people who wanted to see more short stories. I thought it was a brilliant notion!! What I think would be awesome, though, is having Guest Short Stories, rather like a Guest Post! That way, you do not have the burden or nerves of supplying all the short stories, and your readers can have a safe haven to ‘publish’ their babies and receive encouragement and feedback. I also think that this would provide an excellent opportunity for exploring the results of different people’s creativity, their creative process, and inject some random inspiration to Creativity’s Workshop! My concern with putting short stories up on the web is if you later want to submit the story to a competition or magazine it could be considered ‘already published’ online and would therefore not be accepted. There are lots of sites which already provide places to upload short stories for critiques, (e.g. Independent Writers http://inwriters.webs.com/) but I don’t feel that Creativity’s Workshop is set up for that kind of use (at least not at the moment).